Marvelling at the Cliff of the Giants and to be photographed with this natural wonder can be made real with a visit to the El Mirador Archipenque. From this panoramic observation deck, you can also enjoy the sweeping vistas of the Los Gigantes Cliffs, the Sports Pier, La Gomera Island and the La Palma Island. From the harbour, you will need to climb to El Mirador Archipenque to enjoy the ethereal sunset. Visiting during mid- morning will also be a good time to visit as at that time the cafeteria tables are mostly secluded. Coffee and refreshments are served here and after that you can also check out the gift shop for some fantastic souvenirs. A very scenic view of Los Gigantes and on a clear day you can see all the way to La Gomera. You park the car next to the road where it is widened. There is also a small cafe next to the viewpoint. I'd love to give a higher rating but to be honest the towns vista/scenery/view was spoiled by the hotels and property's that are dotted all over, from the cliffs edge right down to the sea edge. It's awesome traversing the steep roads on foot (bring water) especially on 2 wheels. There's enough choice when it comes to accomodation, parking on street is possible but not abundant, dining is easy as there's plenty of restaurants/eaterys, amd plenty of stores including a Hiperdino supermarket for most of your needs. On a photo opportunists point of view there are some good vantage points but not many as theres usually somthing concrete in view. 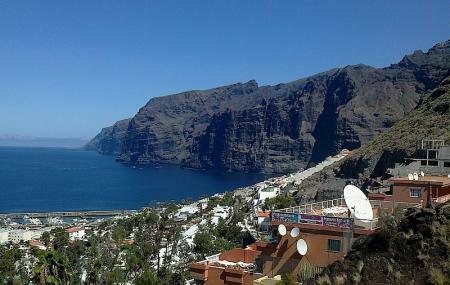 Great views to Los Gigantes. There are also a souvenir shop, cafe (delicoious coffee and almond cookies) and toilets available. The strech for parking spaces is short and spaces can all be used up. Nice place to observe los gigantes! Must visit for all. Awesome views and air!